Following a 3-0 triumph in the Test series, the Indian cricket team continued to assert its supremacy as New Zealand bore the brunt of the young guns in the first encounter of the five-match One-Day International (ODI) series at the HPCA stadium, Dharamsala on 16 October. 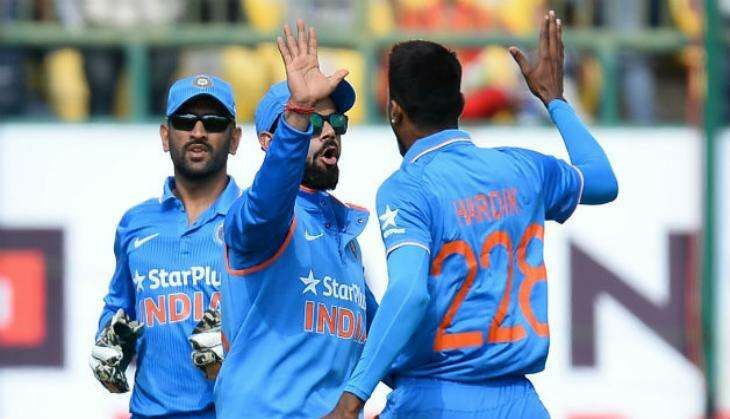 With India deciding to rest Ravichandran Ashwin, Mohammed Shami and Ravindra Jadeja, the young guns stepped up to the task in the absence of senior bowlers and shot the Kiwis down for a mediocre total of 190 runs in 43.5 overs. Umesh Yadav, in the absence of Shami, led from the front and finished his spell of eight overs with impressive figures of 2-31. But, it was Hardik Pandya who stole the limelight with a memorable ODI debut. The 23-year-old, who had only represented India in T20Is, took three crucial wickets at the expense of 31 runs in his spell of seven overs. On the other hand, Kedar Jadhav, who played his last ODI in June this year, also played his part with figures of 2-6 in three overs. Amit Mishra, who has been missing out on playing in ODIs since 2015, claimed three scalps for 49 runs in 8.5 overs. The absence of Jadeja and Ashwin also gave an opportunity to young Axar Patel who remained wicketless and looked a bit expensive. If batting was a lottery, Kane Williamson-led New Zealand failed to buy the ticket. Having won the toss, the Kiwis were let down by the batsmen who failed to perform on a belter of a pitch. New Zealand found themselves in an embarrassing situation early on with Pandya and Yadav ensuring the hosts lose their first five wickets for a mere 48 runs. It was the first time in 29 years that a team had lost five wickets for a lower score against India at home. Martin Guptill's poor run continued to haunt the Kiwis as the opening batsmen never looked comfortable before being dismissed for 12 runs. On the other hand, skipper Williamson (3) Ross Taylor (0), too, failed to deliver. It was Taylor's third duck of the ongoing New Zealand tour of India. In his last eight innings in international cricket, the right-hander has now been dismissed four times without scoring a single run. Tom Latham (79*), who slammed his fourth fifty on this tour, was the only silver lining for the Kiwis who managed to reach 190 after being reduced to 65-7 in 18.4 overs. After failing to find support from the frontline batsmen, Latham was finally aided by Tim Southee (55) - who notched up his maiden ODI fifty in testing times. The duo added 71 runs for the ninth wicket to propel the total for New Zealand. With few runs to play for and the dew factor, the New Zealand bowlers now face a daunting task against the likes of experienced Virat Kohli, Rohit Sharma and Ajinkya Rahane.